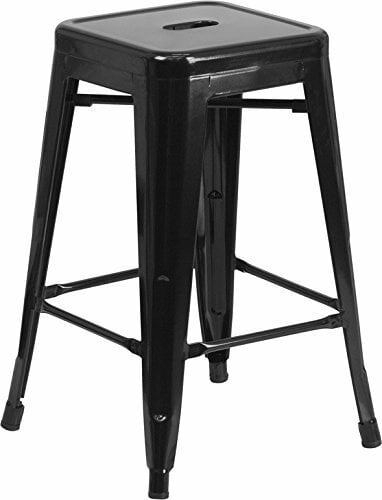 Brighten up any space with the stackable Industrial metal stool from Office Chairs Canada.The sleek contemporary style stool will will add a modern industrial appearance to your home or work space.The stools can easily and neatly stack together to make it great for stoing and space saving. X-brace under the seat that provides additional support and stability. No-mark rubber feet keep them from sliding and scratching hardwood floors. This all-weather use stool is great for indoor and outdoor use. For longevity, the stool should avoid long peroid of exposure in wet weather. Durable Finish available in powder coated Black, White, Gunmetal (transparent) and Galnavized. Other colors available on customer order.